A STEADY progression of baby boomers, gay and green buyers have turned Puna into the fastest-growing district in Hawaii and one of the most sought-after enclaves for real estate. While the region's lack of paved roads, piped water systems, sewers, streetlights, sidewalks, mail delivery and nearby stores and entertainment have deterred some from moving to Puna, others have reveled in the isolation and low prices. In the last decade, Puna has seen the median price paid for single-family homes increase threefold. While single-family homes on the Big Island realized an average 18 percent annual price appreciation over the past five years, the Puna district itself averaged 27 percent appreciation for single-family homes and 61 percent for land. Still, the region is among Hawaii's most affordable and diverse real estate markets. Would-be buyers driving rental convertibles have been knocking on doors offering homeowners cash for choice properties, and custom builds have begun to replace the kit- and plantation-style houses, grass shacks and hippie buses. Like lava, money is flowing through Puna. And while it brings beauty, sometimes it burns what it touches. JIM CROW, a semiretired 60-year-old housing contractor from Washington, moved to Puna eight years ago to get away from it all. Like many in the steady progression of baby boomers, gay and green buyers who have turned Puna into the fastest-growing district in Hawaii, Crow bought a fixer-upper, gutted it and turned it into his own little piece of paradise. He said that he enjoyed living in a time warp where he could purchase prime real estate at 1970s prices. While the region's lack of paved roads, piped water systems, sewers, streetlights, sidewalks, mail delivery and nearby stores and entertainment have deterred some from moving to Puna, Crow reveled in the isolation. 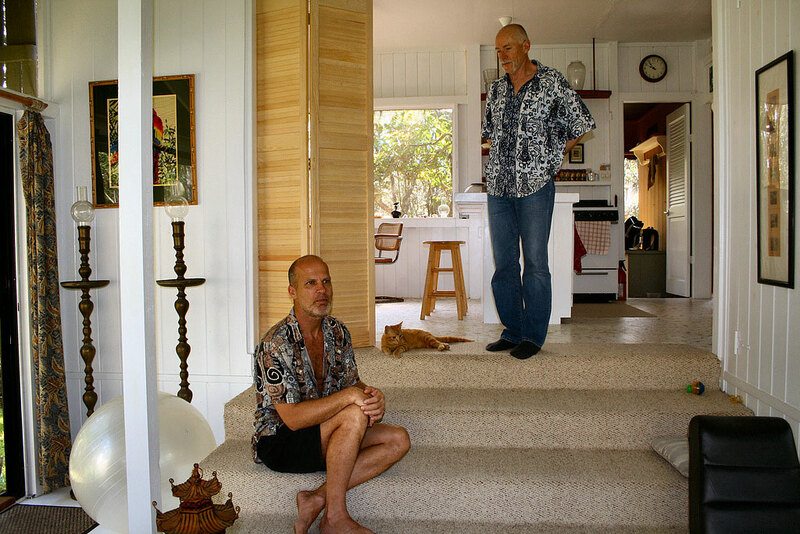 For several years, Crow and co-owner Robb Williams painstakingly transformed their rundown duplex near the ocean from a halfway house for abandoned teenagers into an East meets West camp house that provides three separate living quarters. Now, Crow is ready to move on. "I want to live in a more rural place," Crow said. "Puna has become too crowded." He and Williams have listed the property, which includes a duplex and studio, for $425,000, in hopes of capitalizing on Puna's next wave of mainland buyers. While Puna, like most of Hawaii, experienced some real estate softening beginning late last year, the region's long-term forecast is bullish. According to the Honolulu Board of Realtors' multiple listings service, 89 out of 176 listings on the Big Island come from Puna. That's nearly four times the number of Kona listings. While the word is out about Puna's investment potential, land is still cheap there because of the vast supply of lots, poor infrastructure and close proximity to Pele's wrath. "This will remain true, and the trend of the population moving into these subdivisions is likely to continue," said Chris Yuen, Hawaii County Planning director, in a recent planning letter. In the late 1950s and 1970s, 48,000 residential lots were planned as part of subdivision in Puna, but to date only about a quarter of these have been built, he said. In the last decade, Puna has seen the median price paid for single-family homes increase threefold. While single-family homes on the Big Island realized an average 18 percent annual price appreciation over the past five years, the Puna district itself averaged 27 percent appreciation, said John Jacobson of Prudential Realty. Niche markets, made up of gays, greens and boomers, have spurred Puna's growth, said Howard Dinits, who is known as the Big Island's "Bio-Friendly Realtor" because he takes clients around in a car that runs on biodiesel made from cooking oil. "We're called Punatics," said Dinits, whose specialty has been the Puna district, since the cost of living in California enticed him to move to Hawaii several years ago. 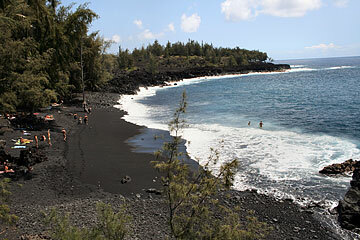 Though hippies still play drums or cavort naked at Kehena's Black Sand Beach on most Sunday afternoons, and Rastafarians exchange pakalolo in sight of anti-drug signs, Puna is gentrifying. Mercedes, Hummers, BMWs, and stretch limos have become common along Puna roadways. Tourists routinely stop to gawk at a Disneyland-meets-Morocco-style castle being erected along the highway outside Kalapana Sea View estates --which, according to Prudential Locations, has achieved a 45 percent annual price appreciation since 2002. 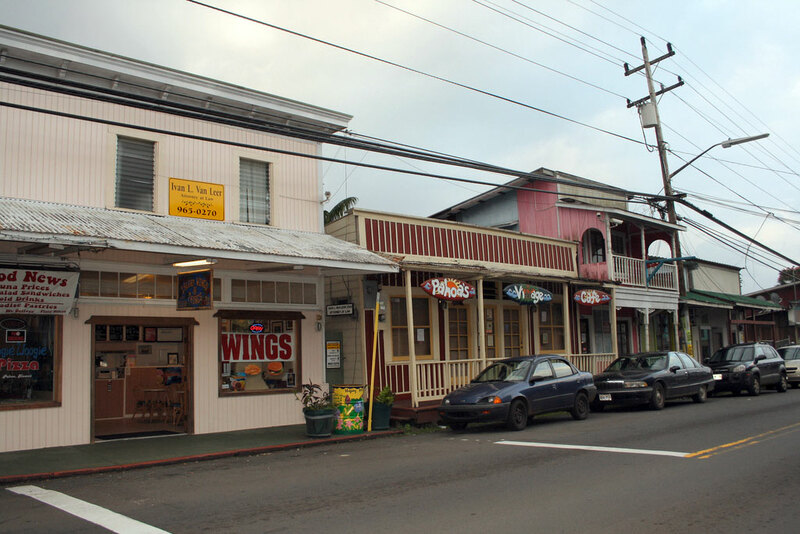 Even Pahoa, once favored by hippies and loners as the Old West town at the end of the rainbow, now has a strip mall, an Internet café and a Subway, the town's first mainland fast-food franchise. It's due to get a McDonald's soon. A slew of gourmet restaurants also have opened in the town, where the smell of patchouli oil now mixes with couture fragrances. "It's a killer town," said Dennis Frederickson who was taking a stroll at dusk on a recent Saturday through the blinking lights of Pahoa with his family -- wife Lokelani and keiki 8-year-old Lava and 6-year-old Kriya. Frederickson, who works as a cook at the Pahoa Village Café, known for its eggs Benedict, is one of a steady progression of neighbor islanders who have joined mainlanders in relocating to Puna. "It's cheaper than Maui by a long shot," he said. "Pahoa might just be one of the last cool little towns. The growth was inevitable. If they do it in a productive way, I guess that I'm OK with it." Builder Randy Lee, who was enjoying a smoke and a pau hana drink while passing through Pahoa on a recent Saturday, said that he's not surprised that the region has been discovered. 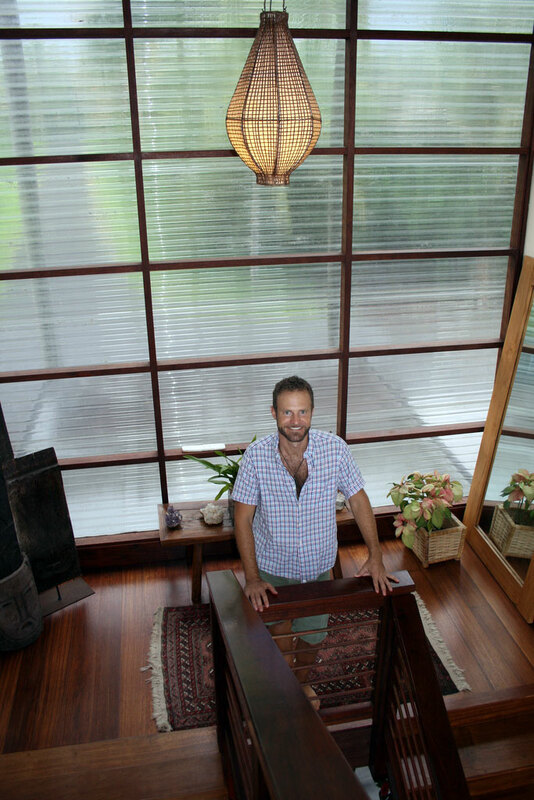 The fine-quality pakalolo, the hot springs and the region's laid-back attitude are what make it attractive to new permanent residents like himself as well as real estate investors and second-home buyers from Europe, Asia and the mainland, he said. "People from China, the mainland, they're all coming here," Lee said, adding that many tourists travel near Pahoa on their way to Hawaii Volcanoes National Park. While Oahu loses about 4,829 people a year to the mainland and neighbor islands, the Big Island's population is growing by about 2,922 people every year because of migration, according to data from the state Department of Business Economic Development & Tourism. 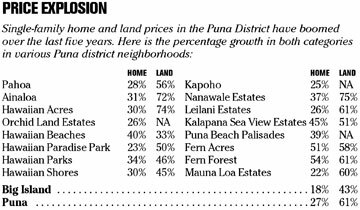 Puna and Kau, where median homes still range from about $200,000 to $550,000, have spurred much of the residential boom on the Big Island. From 2005 to 2006, the Big Island granted 3,000 new residential building permits, a number on par with new builds in Oahu. The high cost of resale property also has increased the number of land deals taking place, Dinits said. While the Big Island has achieved a 43 percent return on land in the past five years, Puna land buyers earned a 61 percent annual average five-year rate of return. "Puna is still the last frontier in terms of real estate in Hawaii -- everything else costs more," he said. 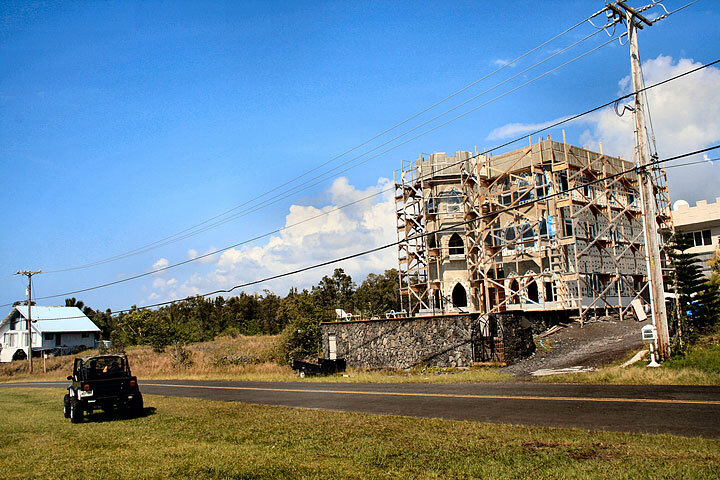 Custom builds have begun to replace the kit- and plantation- style houses, grass shacks and hippie buses. There's a second home in Puna Beach Palisades on a 1955 lava field designed by Craig Steeley and Robert Trickey that was featured in the New York Times. There's also a hippie bus for sale, like the one near Black Sand Beach, that is listed on the Honolulu Board of Realtors' Web site for $65,000. Like lava, money is flowing through Puna. And like lava, sometimes it burns what it touches. The growth has brought a range of employment opportunities for professionals, telecommuters and entrepreneurs -- especially in fields that cater to wealth or real estate. However, others have found the job climate arid, said Tim Ambrose, a 41-year-old psychologist who moved to the district in 2001 with plans to build in Puna Beach Palisades. 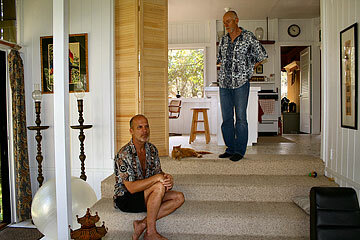 Instead, community growth caused Ambrose to build his 4,300-square-foot custom home on a secluded oceanfront lot in Kaimu. While Ambrose has thrived professionally and plans to expand his practice, his calendar is filled with patients who have been challenged by their surroundings, he said. "Most people here are living very close to the bone," Ambrose said. "Not a lot of people are thriving here -- most are just surviving." Many of Ambrose's patients have told him that they did not anticipate the shortage of work in Puna or the isolation, he said. Others have said that they were dismayed to find Puna's cost of living on par with more expensive regions in Hawaii, Ambrose said. Interestingly enough, it's mainly newcomers who complain about Puna's transformation, said LaMont Carroll, owner of the Aloha Outpost Internet Café. Carroll, who is for sustainable growth, said the real estate boom has more than quadrupled his business. 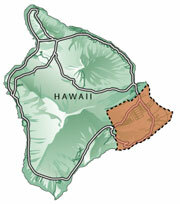 "The vast majority of the people that complain about Puna have been here three years or less," Carroll said. "Everybody wants to shut the barnyard door." Longer-term Punatics have adopted the region's famous laissez-faire attitude, which has made it a haven for diversity. A few even have benefited from the boomtown atmosphere of their once isolated outpost. Derrick Bihag purchased the vacant lot across the street from his Hawaiian Paradise Park home for $7,000 at the beginning of the boom and less than a year later made a $92,000 profit when he sold it to a mainland couple. Bihag, whose keiki still play on the lot, also earns extra income maintaining the land for the investors. "When the boom happened, the value of property began to move up and we saw a different quality of people begin to move into the neighborhood," said Bihag, who paid $68,000 for his home in 1998. "Pahoa had a reputation for gunfighting and everything," Bihag said. "It was like the OK Corral -- but no more." But others like 85-year-old Robert Wolff, a psychologist, educator and author, have questioned Puna's rapid growth and the impact it could have on the community. While Puna's growth has benefited some, it has negatively impacted the aina and the quality of life for kamaaina, Wolff said as one of the roosters that roam his neighborhood crowed in the background. "(Growth) is good for the speculators who bought and sold after six months, did that a few times, and moved out before it all stopped. It is good for the county. It is good for car-rental agencies, for real estate agents. Probably good for restaurants and other businesses who cater to people -- more people, more profit," Wolff said. "But for us who live here and don't plan to move, what is good about it? For the aina it is not good." Wolff, who moved to Puna to be near his children after retiring from the University of Hawaii, said that increased development has caused him to want to move from Paradise Park. However, price appreciation has ruled that option out, he said. "This used to be the final escape from civilization, but now civilization is right here," Wolff said. "I'd move, but where would I go?"